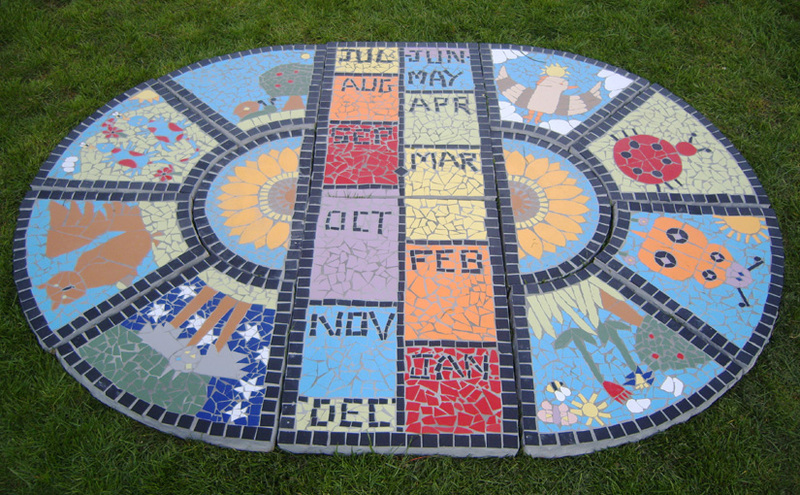 Mosaic workshops for schools, communities and everyone else! 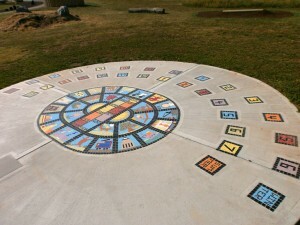 A Human Sundial allows you to become part of the machinery telling the time. 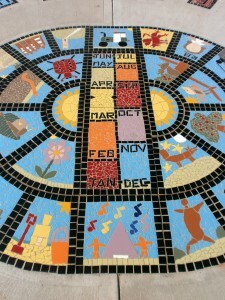 It consists of two arcs of numbers set into the ground (British summer and winter time) and a set of months. By standing on the current month your shadow falls onto the time. 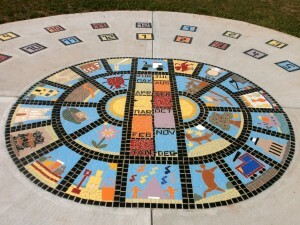 Mosaic is the perfect medium to use to create a human sundial. Eye catching, durable and involving a whole school or group in it’s creation. It can include extra decorative elements to link to a celebration or locality, and for schools can link to the National Curriculum. Level ground, ideally South facing ground – with room for a 6m diameter circle that is free from other shadows at all times. Community of Perretts Park – involved children from three schools, a youth club and under 5’s play scheme. Brading Roman Villa – working with the museum and three local schools to create a sundial for the museum grounds. Keysham Mencap – working with a summer holiday scheme for Mencap and placed in Keysham Memorial Park. Bristol Kite Festival 20th anniversary – involved school pupils from Hillcrest Primary School and placed in grounds of Ashton Court. Holburne Museum of Art – Brunel Anniversary project to work with pupils from Twerton Infant School to create a sundial for a school in Bath. 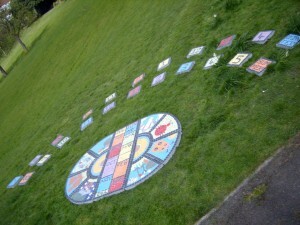 Alvaston Park Friends & St. Martins School – Working with the school to create a Human Sundial project for the adjacent park.